Just £12 (non CVTA Members) or £8 (CVTA Members) plus £4 on the day for a Dayrider bus ticket (free for OAP / Concessionary Pass Holders). Come and visit historic ST AGNES & ST PANCRAS CHURCH which Pevsner described as “Liverpool’s noblest Victorian building”, a Grade 1 Listed treasure-trove. 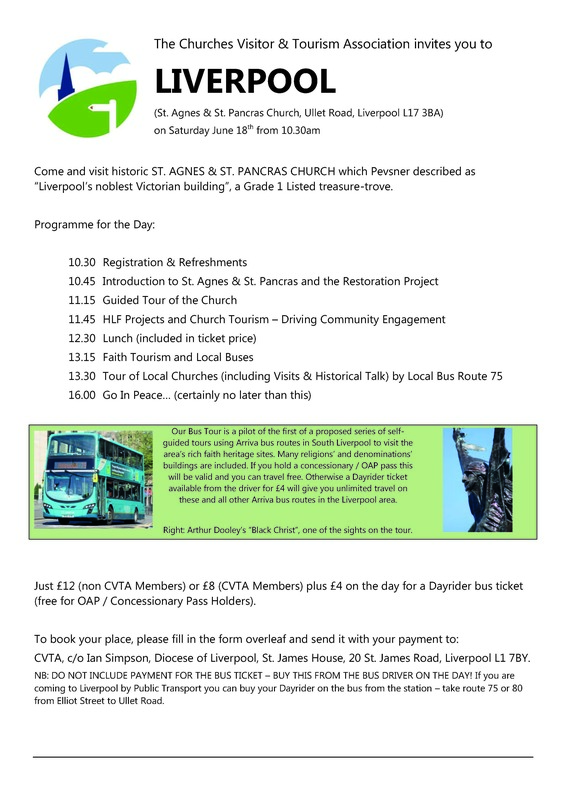 Our Bus Tour is a pilot of the first of a proposed series of self-guided tours using Arriva bus routes in South Liverpool to visit the area’s rich faith heritage sites. Many religions’ and denominations’ buildings are included. If you hold a concessionary / OAP pass this will be valid and you can travel free. Otherwise a Dayrider ticket available from the driver for £4 will give you unlimited travel on these and all other Arriva bus routes in the Liverpool area. Right: Arthur Dooley’s “Black Christ”, one of the sights on the tour.